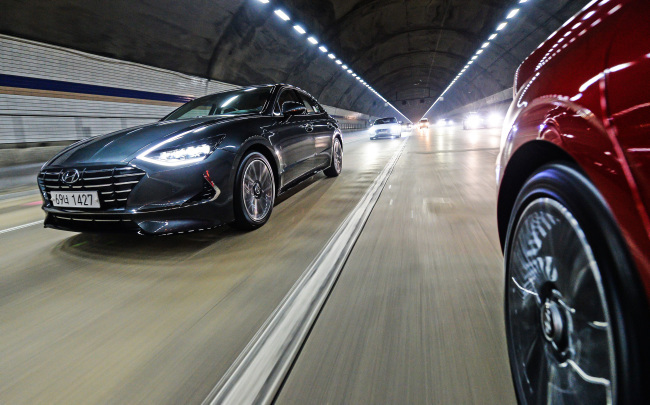 Hyundai Motor’s eighth-generation all-new Sonata -- the vehicle’s first new version in five years -- has changed seemingly everything about the car except the name. It has undergone some drastic design changes, featuring hidden lighting and a coupe-like frame for the first time. It has adopted a sloping roofline and low deck lid to make the body look longer. The company said the new Sonata’s design, dubbed “Sensuous Sportiness,” was inspired by last year’s Le Fil Rouge concept that was first unveiled during the Geneva Motor Show. Breaking the steady-selling sedan’s conventional image, the new Sonata’s interior has been changed to offer a high-tech, premium feel in the front seat with a wide dashboard and buttons that are intuitive to use. Drivers can also use a smartphone-based digital key by downloading a mobile app to unlock and start the vehicle. The key can be shared between several people. The power train has also been completely overhauled. For all four trim levels -- Gasoline 2.0, LPI 2.0, Gasoline 1.6 Turbo and Hybrid -- Hyundai said it has adopted the new engine called Smart stream, to enhance fuel efficiency. The Gasoline 2.0 model runs on the G2.0 CVVL engine, tuned to deliver 160 horsepower and 20 kilogram-force meters of torque. It has increased fuel efficiency about 10.8 percent from the previous model. During a test drive through Gyeonggi Province, along a 75-kilometer route from Ilsan to Namyangju, the ride was very smooth on the road, but when the car picked up speed on the highway wind and road noise seeped into the cabin. The new Sonata shifts gears electronically at the push of buttons well placed and easy to use, and also free up console space compared to the traditional gear lever. Some safety features also stood out, such as a built-in camera that covers blind spots at the front and the rear of the car, allowing the driver to check lanes more easily. The price begins from 23.4 million won ($20,600) and goes up to 32.8 million won for the highest trim for gasoline model. Sales began on March 21.